The mission of the Chicago Southwest Development Corporation is to create self-sustaining communities throughout Chicago’s underserved neighborhoods, to enrich the lives of families through nontraditional education, recreation, and health and wellness programs, and to enhance social service programs that specifically meet the needs of each individual community. This innovative model generates revenue through its leases which fund programs and projects that are traditionally funded short-term by state, federal and city tax dollars. 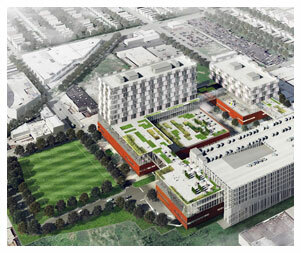 Focal Point Community Campus will provide valuable programs and services to more than 400,000 residents in the southwest Chicago communities, while serving as a national model for community development. The campus will reside on 32-acres at 31st Street and Kedzie Avenue in southwest Chicago, the former site of the Washburne Trade School. It will deliver a combination of retail, wellness, education, arts and recreation services customized to meet the needs of local residents. The 1.2-million-square-foot complex will offer a range of retail, wellness, education, arts and recreation elements focused on the complete well-being of community members, instead of purely on one element such as health care. However, a relocated Saint Anthony Hospital will serve as a tenant of the campus and will continue to provide emergency and medical care that turns no one away, regardless of ability to pay. There will also be an outpatient and specialty clinic to meet a wide range of rehabilitative and health maintenance needs. To find our more about this project, please visit FocalPointChicago.org. © Chicago Southwest Development Corporation 2012-2018. All Rights Reserved.